The Kemper R3 Dual-End Ribbon Tool has a loop on each end. 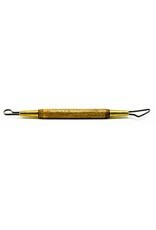 Kemper 6-inch Dual-End Ribbon Tools come in a variety of shapes and are used to cut and shape clay and wax. The ends are made from clock spring ribbon steel and are firmly attached to the hardwood handles with brass ferrules.